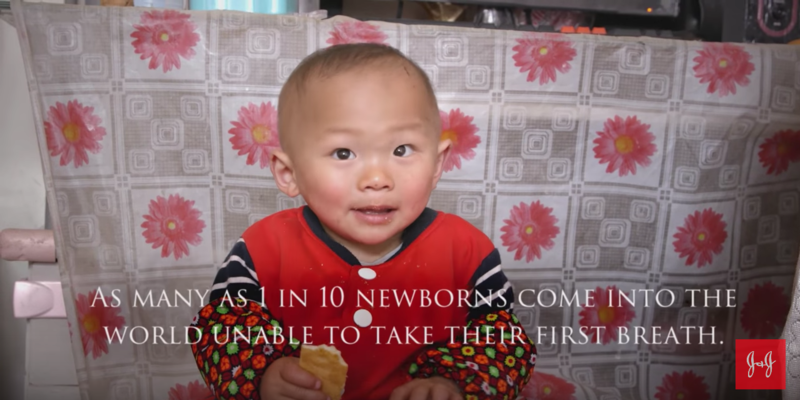 Pipi was a direct beneficiary of the China Neonatal Resuscitation Program (NRP), which formed more than 10 years ago when Johnson & Johnson and a group of visionaries came together under a single goal: to help more newborns in China survive the fragile moments immediately following birth. Our dream was to have one person who was skilled to help a baby breathe at every birth….No small task in the largest country in the world! Worldwide, more children die within the first 28 days of life, the newborn period, than at any other time in childhood, even though the skills and interventions needed to save their precious lives are well-known. For more than a century, Johnson & Johnson has been dedicated to helping newborns to survive and thrive – no matter where they live. Our collaborations for newborn health span more than 20 countries, and range from the highest level of training, to simplified methods that can be used in low-resource settings. Our recent commitment of more than $30 million to the Every Newborn Action Plan (ENAP) reaffirmed our longstanding dedication to the world’s mothers and children, because no baby should die from a preventable cause. The China Neonatal Resuscitation Program (NRP) is one example of the depth of the Johnson & Johnson commitment to save newborn lives. The partnership* has ensured that doctors, nurses and midwives in every Province in China have skills in neonatal resuscitation. To date, they have saved more than 150,000 babies lives. The China NRP is anticipated to save 15,000 newborn lives every year, and help as many as 600,000 annually have a healthy start in life. The long-term nature of the partnership enabled the China CDC to evaluate the economics of birth asphyxia, revealing that skilled health workers could reduce the economic burden for China by more than $2.2 Billion Chinese Yuan (>$300MM USD). Its success led to other innovative partnerships, reaching into the most vulnerable communities. As a result, skilled birth attendants learned Helping Babies Breathe to save newborns attendants even in settings where resources and equipment are limited. This year, building on our 2010 commitment to every Woman Every Child movement, Johnson & Johnson will step forward with an even more robust commitment to achieve the Sustainable Development Goals. The day that we are born is the most dangerous day of our lives. Children like Pipi who have survived with the help of heroic nurses, midwives and doctors who joined our program motivate me every day. These children are their parents’ hope. They are our future. *Partners in the China Neonatal Resuscitation Program (NRP) called Freedom of Breath, Fountain of Life include: China Ministry of Health, China CDC, American Academy of Pediatrics, Chinese Perinatal Society and Johnson & Johnson. Partners in the Helping Babies Breathe initiative include USAID, Save the Children and many Survive & Thrive collaborators.